TAMPA, FL and GRANTS PASS, OR – January 8, 2019 – Vector Solutions, the leader in industry-focused eLearning and performance support solutions, expands its capabilities with the acquisition of CrewSense, the leading employee resourcing and human capital management software for mission-critical sectors including public safety, utilities, and manufacturing. Founded in 2012 and headquartered in Grants Pass, Oregon, CrewSense is used by over 650 mission-critical organizations and 100,000+ users across North America. The platform provides modules for automating complex 24/7 shift scheduling, union-based overtime rules, time and attendance records and more. It provides a cloud-hosted intelligent, rules-based system that allows administrators to alert, match-qualify and fill openings quickly with zero human interaction required. “We are thrilled with this exciting new partnership, and how it will provide our clients access to even more incredible solutions, additional technology strength, and continued commitment to innovation,” said Casey McIntosh, Founder and CEO of CrewSense. “This will allow us to more rapidly execute on our product development roadmap, leverage the world class customer support capabilities of Vector Solutions and ultimately provide a better overall product experience and value to our customers,” McIntosh said. The acquisition furthers Vector’s strategy to expand its leading eLearning and training platform into a complete workforce and organization performance optimization solution. The CrewSense scheduling solution will be offered under Vector’s Public Sector business unit and will be integrated as a product offering under the TargetSolutions brand. Clients of both Vector and CrewSense can expect to receive the same level of outstanding products and customer service to which they have been accustomed. Vector Solutions, a leader in eLearning and performance support, provides award-winning SaaS solutions for the architecture, engineering, construction (AEC), industrial, facilities management, public safety, IT and education industries. Its brands, RedVector-Convergence Training, TargetSolutions, and SafeSchools, deliver continuing education (CE), training, technology and performance management solutions using the latest innovations in learning and technology to create safer, more capable, more compliant organizations. Its extensive online and mobile learning library offers approximately 8,000 courses written by over 250 subject matter experts and reaches over 7 million professionals worldwide. The company was founded in 1999 and is headquartered in Tampa, Florida. For more information, visit www.vectorsolutions.com. Follow us on Twitter @VectorPerform and on Facebook at www.facebook.com/VectorPerformance. CrewSense’s goal is to create software that empowers your mission-critical workforce. By making the most complicated organizational tasks simple and reliable, CrewSense is re-imagining employee resource management for modern organizations. CrewSense serves thousands of users nationwide and is headquartered in beautiful Southern Oregon. 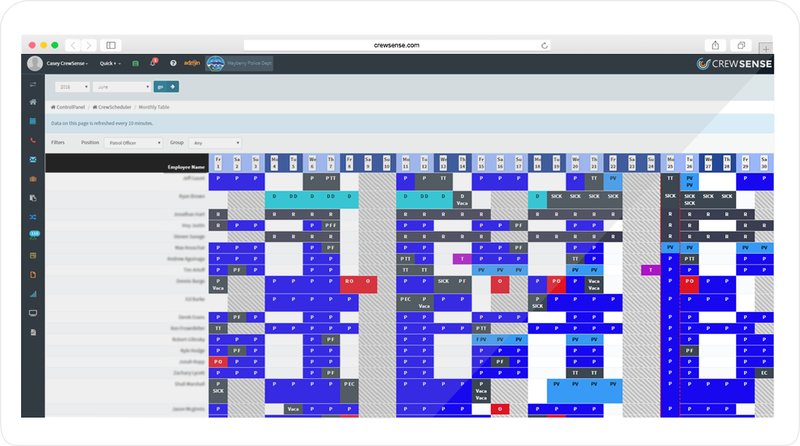 CrewSense has exploded into the Public Safety scheduling and employee resource market since bringing its flagship product to market in late 2012. Now serving nearly 100,000 users across North America, the CrewSense platform offers cloud-based scheduling, automated overtime hiring, shift bidding modules, integrated telephony (SMS, Phone, Mobile push), time & attendance and more via their state-of-the-art web and mobile platforms. Learn more at http://www.crewsense.com/. CrewSense™ partners with Halligan for streamlined Public Safety integration. 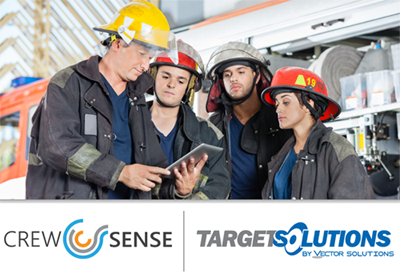 GRANTS PASS, ORE. [July 23, 2018] – CrewSense™, a leading Employee Scheduling, Resourcing and Human Capital Management platform for mission-critical industries (public safety, manufacturing, utilities & clinical) – announces today a partnership with Halligan, a cloud based vehicle & apparatus inventory solution, built for Fire / EMS Departments. “At CrewSense, we’re always looking for partners to help our customers become more efficient and better streamline their processes”, commented Casey McIntosh, Founder and CEO. “Using our public API, Halligan was able to write an integration to CrewSense… This allows scheduling and roster data to freely flow from CrewSense, into Halligan. This will make using the Halligan application much more user friendly for our joint customers.” McIntosh said. The integration will allow Halligan to update rosters, personnel and notifications – in real time, driven by the CrewSense scheduling engine. “In order to give users the simplest possible experience, Halligan needs to know where and when a user is working. CrewSense offers a robust scheduling platform where we could read that data so it was a logical integration to build”, said Alex Montgomery, Co-Founder of Halligan. To learn more about Halligan, please visit www.halligan.io or checkout the help article on the integration by visiting: http://help.halligan.io/integrations/crewsense-integration. GRANTS PASS, ORE. [June 26th, 2018] – CrewSense™, a leading Employee Scheduling, Resourcing and Human Capital Management platform for mission-critical industries (public safety, manufacturing, utilities & clinical) – announces today the release of a free plan of it’s popular web application. “At CrewSense, we’re always looking for ways to help our customers become more efficient and better streamline their internal processes,” commented Casey McIntosh, Founder and CEO. “Having the option to use the core functions of CrewSense, specifically workforce management and scheduling, at no cost – just makes sense. We’ve become a leader in complex labor scheduling and employee resource management over the last 5 years, mainly serving large complex workforce’s at Municipalities and Local Goverment. Now we can offer a product for smaller Organizations as well.” McIntosh said. The Free Version will have full scheduling, payroll, and third-party integrations included at no cost. More advanced features like API access, complex overtime rules-building, auctions and time off accruals will remain part of the paid plans. “There are thousands of smaller Organizations who still need a solution to the problems that CrewSense solves, without having a large budget. We feel we are in a position to offer a cost free platform to all Organizations, regardless of budgetary constraints.” – McIntosh stated. CrewSense has exploded into the Public Safety scheduling and employee resource market since bringing its flagship product to market in late 2012. Now serving nearly 100,000 users across North America, the CrewSense platform offers cloud-based scheduling, automated overtime hiring, shift bidding modules, integrated telephony (SMS, Phone, Mobile push), time & attendance and more via their state-of-the-art web and mobile platforms. CrewSense is a leading employee resourcing and human capital management software that empowers mission-critical sectors by making complicated organizational tasks simple and reliable. Serving nearly 100,000 users across North America, CrewSense is a cloud-hosted intelligent, rules-based platform that allows administrators to alert, match-qualify and fill openings quickly with zero human interaction required. CrewSense is a Vector Solutions brand.